Out of Africa and into Your Collection! A term originally created by 19th century big game trophy hunters, Africa's "Big Five" referred to the most difficult -- and dangerous -- animals to hunt and kill on foot. Today, the lion, elephant, buffalo, rhino and leopard are still pursued by travelers to African parks and reserves. But these 21st century hunters are usually armed only with the latest zoom lenses and camcorders, on the hunt for the ultimate photo shoot! Can't afford to go on safari? No problem! Now you can capture your own elephant as a majestic 99.99% pure gold proof! Spread across 37 countries in sub-Saharan Africa, the remarkably adaptable African Elephant is the largest mammal in the world, weighing up to 12,000 pounds and standing 10 feet tall. But while a ban on all ivory trade has helped stabilize the population to around 600,000 in the last decade, illegal ivory poaching still threatens this great beast. Fortunately, dedicated conservationists are working to protect and breed these beloved animals for future generations! Bring Home Your Own Elephant, Immortalized in a Half-Ounce of Gold! 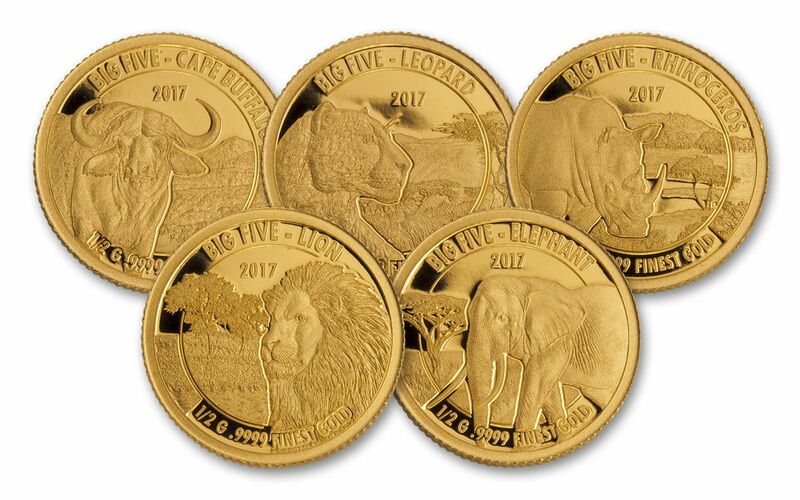 Of course, the best way to bring an elephant to your collection is with this gorgeous 2017 Big Five Gold Proof. Minted in a 1/2 gram of highly pure 99.99% fine gold, each Elephant Proof is struck multiple times using polished dies and hand-selected planchets, producing a mirror-like finish with razor-sharp details. 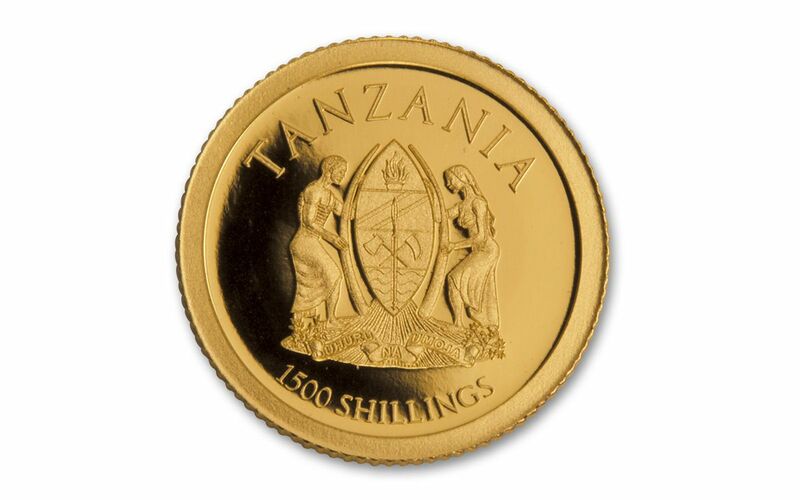 Each legal tender 1,500 shillings Tanzania Elephant Proof comes encased in an acrylic capsule and presented in a colorful, wallet-sized card that is also the proof's certificate of authenticity. This GOVMINT.COM EXCLUSIVE has a mintage of only 5,000. Add that fact with this proof's perfect mix of beauty and affordability and you can see why we doubt this will last long in our vaults! 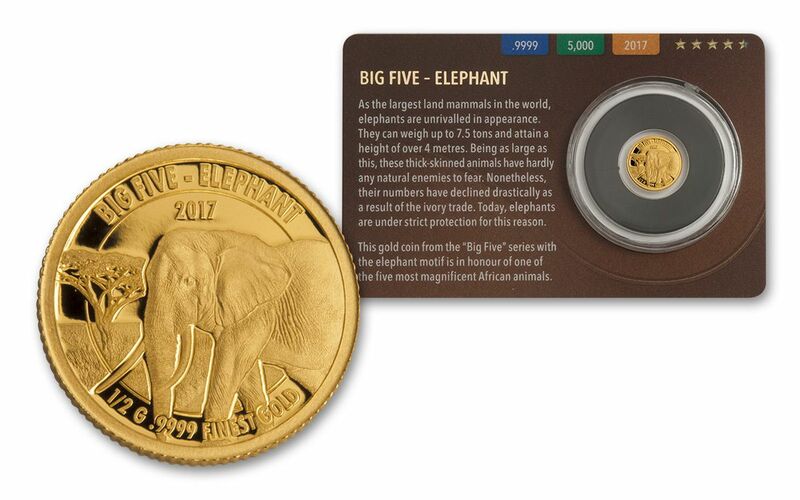 Don't let this elephant get out of sight -- order your Big Five Gold Proof today!